Both Hepburn and Bennett were asked to continue to serve in their leadership positions in the CWSA until replacements could be found, and did so, but both also deepened their support for the National Woman’s Party. 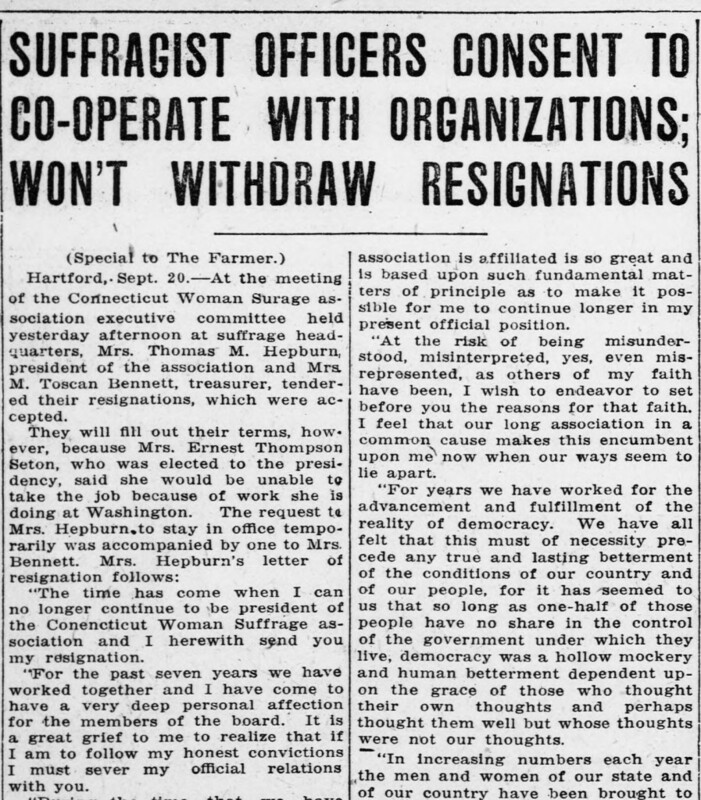 The other CWSA members who resigned their offices included Annie Porritt, Katherine Day, Emily Pierson, Elsie Hill, Katherine Mullen, and Catherine Flanagan. Bennett, Hill, and Flanagan were among the 168 women who served jail sentences for participating in the picketing (Stevens cited in Nichols, p. 19). The NWP campaign at the White House has been described as “a contest of wills between the leader of a nation finally plunged into a world war and the leader of an organization [Alice Paul] who refused to recognize the war as the paramount issue facing Americans, and particularly American women” (Lunardini, p. 104). In Votes and More, author Carole Nichols argues that the ideological dispute between the NWSA and the NWP in Connecticut was relatively muted and that the local groups and key individuals continued to collaborate for ratification and other reform measures (Nichols, p. 19-21), but there is no dispute about the impact of war hysteria on the White House campaigners. Suffragist Doris Stevens described in her 1920 book Jailed for Freedom how the suffragists’ provocative banner calling the President “Kaiser Wilson” became the excuse for soldiers, sailors, and others to attack the pickets (Stevens, p. 89). This image drawn from the photo collection of the Library of Congress is testament to that. From the Photo Collection of the Library of Congress. 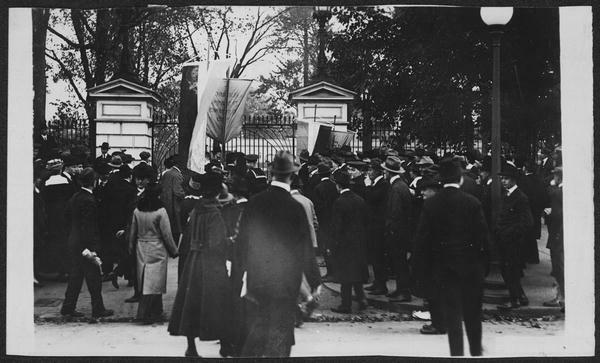 “Sailors Attacking Pickets, 1917 . . .“ Harris & Wing, Washington, D.C.
As historian Robert H. Zieger describes it, “Throughout the summer of 1917, the White House gates became the scene of almost daily scuffles and assaults as outraged war supporters attacked the suffrage advocates. Police responded by jailing the suffragists” (p. 150). Their jailing and treatment in prison became a cause célèbre. As Hepburn noted in her letter of resignation, by September of 1917, England, Russia, and Canada had all granted women the right to vote, in some measure to boost the effectiveness of mobilization for war. In the United States, it was not until the fall of 1918 that Wilson finally came out in support of woman suffrage. The Nineteenth Amendment to the United States Constitution was finally ratified on August 20, 1920. Connecticut Woman Suffrage Association Records, RG 101, State Library, Finding Aid available at http://ctstatelibrary.org/RG101.html. Lunardini, Christine A. From Equal Suffrage to Equal Rights: Alice Paul and the National Woman’s Party, 1910-1928 (New York: New York University Press, 1986). Found at the State Library at http://www.consuls.org:80/record=b1024874~S1. Nichols, Carole. Votes and More for Women: Suffrage and After in Connecticut (New York: Haworth Press, 1983). Found at the State Library at http://www.consuls.org:80/record=b1457044~S1. Stevens, Doris. Jailed for Freedom: American Women Win the Vote (Troutdale, OR: New Sage Press, 1995 reprint of 1920 text). Found at the State Library at http://www.consuls.org:80/record=b1616824~S1. Suffragist Officers Consent to Cooperate with Organizations; Won’t Withdraw Resignations,” Bridgeport Evening Farmer, Sept. 20, 1917, p. 9. Issue available on Chronicling America at http://chroniclingamerica.loc.gov/lccn/sn84022472/1917-09-20/ed-1/seq-9/. Zieger, Robert H. America’s Great War: World War I and the American Experience (Lanham MD: Rowman & Littlefield, 2000).